Guest post by Carole MCGRANAHAN, University of Colorado. In the back room of an antique store in Kathmandu, I heard an unusual story on a summer day in 1994. Narrated by Sherap, the Tibetan man in his 50s who owned the store, it was about when Mao Zedong came to Tibet as part of the communist Long March through China in the 1930s in retreat from advancing Kuomintang (KMT) troops. Historical narration is a form of ethnographic insight. Histories are never only about facts, but also about specifically cultural ways of ordering the world and thus about the status and nature of those facts. Tibetan histories are no exception. In both written and oral form they provide pedagogic models for legitimating authority, living a good life, and shaping local and national identities (Aris 1997), thus offering views of both longstanding and historically specific Tibetan modes of “enacting the process of reflecting on the self and the world and of acting simultaneously within and upon what it finds there” (Ortner 2006: 57). Sherap’s was not a story of Mao Zedong I had ever heard or read before. Mao enters the story in the expected attired of a Chinese communist revolutionary but departs hastily in the clothing of a Khampa, or eastern Tibetan, trader. If Getag Tulku had truly saved Mao’s life, then surely this tale would be one embraced by the Chinese Communist Party (CCP) as an early example of how Tibetans showed their love for the Party by giving aid to the communist troops on the Long March? Or, if not by the CCP, then memorialized by the Tibetans as an example—perhaps regretted in retrospect—of Tibetan generosity and compassion extended to Mao and the communist troops when they were in dire straits? Instead, this story did not seem to feature in either side’s historicizing of the Tibetan-Chinese encounter. Why was this? Sherap told me this story in one of our very first meetings. At the time I was conducting research on the eastern Tibetan region of Kham (Khams) for a PhD in anthropology and history. An official at Ganden Khangsar, the (now closed) office of the Tibetan Government-in-Exile in Kathmandu, gave me a list of Khampas who I should interview; Sherap’s name was on the list. We met and among other things, I asked him what his area was like before the Chinese occupation of the 1950s. One of the stories he told me was that of Mao in Tibetan disguise. I listened to his narration, wrote it down, discussed this story with him over the years, and searched for more information on the Long March. Had Mao really been helped out of Tibet by Tibetan lamas? If so, how was this episode remembered by Tibetans and Chinese? And, if not, then what had happened and how had this particular story come to be told in exile? My questions then and now were historic and ethnographic. The politics of history and memory are such that what is historicized and remembered is always social, a combination of cultural logics and practices, systems of political hierarchy and authority, and multiple, often contradictory perspectives on what “really” happened (Connerton 1989; Halbwachs [1941/1952] 1992; White 1973). Unlike oral history, where the goal is often to find a truth that doesn’t exist in documentary sources, or to confirm oral evidence with documentary sources if they do exist, ethnographic history takes history, its production, and its narration as an anthropological scope of inquiry. My project thus was not to seek a singular historical truth about Mao, but to get at the ethnographic truths contained in this story, at the social being of truth or “not [asking] whether facts are real but what the politics of their interpretation and representation are” (Taussig 1986). Given the political turmoil Tibetans had experienced since the 1949 victory of Mao’s communists in China and the 1959 escape of the Dalai Lama and thousands of Tibetans to India where many remain today as refugees, I wanted to understand what this history meant politically, culturally, and religiously to Tibetans in exile. In this essay, I want to put certain types of historical narration into dialogue with Giovanni da Col and David Graeber’s “call to revive the theoretical potential of all ethnographic insight” (2011: vii). Building on their idea of ethnography as “a pragmatic inquiry into conceptual disjunctures” (ibid. ), I consider Sherap’s unexpected story of Mao in Tibetan disguise not as a classic Foucauldian tale of subjugated versus erudite knowledge, in which one way of knowing is disqualified as inadequate or illegitimate so as to further reinforce dominant ways (Foucault 1980) but as an argument about narrative excess and culture as contradiction (McGranahan 2010a). In other words, this account is about forms of knowing that exceed rather than challenge what is considered to be normal or sufficient or permitted. That is, if to challenge is to contest or defy or compete, then to exceed is to surpass or to go beyond. It is to not only enact or tell history with rather than against the grain (Stoler 2009), but also move parallel to dominant narratives in manners that may be engaged or indifferent or both. Unstable in many ways—politically, economically, legally, socially—exile is also a creative, generative space. For over five decades, roughly 130,000 Tibetans have lived as a community in exile headed by the Dalai Lama and Tibetan Governmentin-Exile and centered in Dharamsala, India.2 In exile, Tibetans have created many things, including an extraterritorial government, a school system operative in two countries, a parliamentary democracy, multilingual media, a global political movement, hegemonic disciplinary practices, and a number of new genres for oral and written expression. I recognize three distinct historical periods for the exile community: (1) the refugee stage from 1959 to the early-mid 1980s, the very difficult early decades of life in South Asia where community energy was primarily focused on subsistence, and a period during which there was virtually no communication between Tibetans inside and outside Tibet due in part to the severe policies of the Great Leap Forward and Cultural Revolution in China; (2) the growth stage from the early-mid 1980s through 2000 or so, the period in which Tibetan refugees were more well established in their local communities, launched a successful global political campaign, and grew the community as Tibetans began leaving China for India and Nepal—most illegally escaping on foot over the Himalayas—where they were categorized by other Tibetans as gsar ‘byor pa or “new arrivals,” a term used in pejorative and descriptive senses, and (3) the diaspora stage from roughly 2000 to present, the period during which Tibetans moved out of South Asia en masse, migrating to countries around the world including Taiwan, Japan, Australia, and throughout Europe, but especially to North America, both Canada and the United States, while at the same time, migration of Tibetans from inside Tibet to South Asia continued, with new gsar ‘byor pa inheriting the category from earlier generations. From any of these temporal vantage points in exile, events in eastern Tibet in the 1930s may be distant temporally and geographically but not emotionally. Telling history is one way to make claims on the world. Political claims. Social claims. Epistemological claims. History making in exile is not necessarily continuous with pre-exilic ways of apprehending the world. Instead, the production of history—lo rgyus in Tibetan—has opened to new groups in exile, specifically to ordinary people. Whereas in Tibet prior to 1959, history was the domain of the male religious elite, in exile lay commoners have created new narrative spaces for nonelite histories of Tibet (McGranahan 2010b). For the most part, the histories they tell are national ones, modern in the sense of resting on certain types of truth claims about links between people, place, and polity (Dirks 1990; Duara 1995), and also in the recognition of the political force of historiography, that is, acknowledging the writing and telling of history as a political act, both a tool of and against the state (Stoler 1995: 62; Aris 1997). There are few, if any, politically or culturally neutral narrations of the Tibetan-Chinese encounter. And Sherap’s narration was no exception. Historicizing truths in exile involves trafficking across multiple sign systems. Political loss, geographic displacement, cultural rupture, Buddhist religion, and reassembled social forms and relations all define life in exile. Dislocating but not disabling, the cultural and political space of exile is saturated with history and its struggles. Yet what histories are to be told, when, by whom, via what genres, and with what repercussions? There is no singular experience of exile; being a refugee or in exile or in the diaspora is also always inflected by other things such as when one came out of Tibet or was born in exile, where one lives in the diaspora, where one’s family was from in Tibet, as well as age, gender, sect, school, and what is going on in the world at any given time. Sherap is a TreHor Khampa, a person from part of the eastern Tibetan region of Kham now incorporated into the Chinese province of Sichuan. Kham occupies a specific place in the Tibetan imagination in exile: it is a region considered to depart from Central Tibetan norms in social, economic, and religious ways, and yet while wildly independent and somewhat rough, the region also possessed important ties to Lhasa and the Tibetan government (McGranahan 2010a: 60–63). Sherap is also a veteran, a former member of the primarily Khampa citizens’ army Chushi Gangdrug (chu zhi gangs drug) that defended the Dalai Lama and Tibet against the Chinese People’s Liberation Army from 1958 through 1974. He is also a husband and a father and a former Gelukpa monk and a natural storyteller with a keen interest in history. Sherap told me his Mao history over the course of a two-hour long conversation as his wife watched their shop, one of his sons sitting with us listening, commenting, and with tourists occasionally poking their heads into the back room to look at items to purchase, wanting to know the story behind a particular cabinet or string of coral beads, and the chai boy circling through at regular intervals for refills. Important to his narration was location; the histories he told were marked by geography and absence, stories of Tibet told very consciously from a place outside of it. At the time, Nepal was a fledging democracy, not yet immersed in the decade-long civil war of 1996–2006 that would devastate the country, and negatively impact life for Tibetans as the Nepali Maoists (officially the Communist Party of Nepal-Maoist) cycled in and out of power in the years following the end of the war. This is not to say that Sherap might not tell the story in the same way now, or that Tibetans might not tell such stories in Tibet. Rather, it is to mark that the story was told by a specific person at a certain time in exile. With this in mind, I return now to Sherap’s history and to this question: Did Mao really escape Tibet in Tibetan disguise? When the Long Marchers came through, Tibetans in Sherap’s region were just recovering from a war between two neighboring Geluk monasteries: Dhargye Gonpa and Beri Gonpa. During the war that lasted from 1931–1934, the Tibetan Government army aided Dhargye Gonpa and the Chinese Kuomintang army assisted Beri Gonpa. At this time, both the Tibetan and Chinese governments claimed parts of eastern Tibet as part of their own territory. On several occasions since 1913, officials from Tibet, China, and British India had tried to diplomatically delineate the borders between Tibet and India, and Tibet and China. They failed on each attempt, and thus, in modern terms, the geopolitical status of eastern Tibet was unsettled in the first half of the twentieth century (McGranahan 2003). Yet, while there was no internationally recognized geopolitical border, the borderlands were not necessarily unsettled in the minds of the local people. Sherap and other Khampa Tibetans had very clear ideas of local geopolitics, of which territories were aligned with Lhasa and which with China. They frequently explained to me which territories were bod sde and which were rgya sde and why, as well as explained the historicity and relative strengths and weaknesses of these associations. The same held true for the Long March troops that entered these areas, it was very clear to them that they were now in Tibetan lands (Li and Akester 2012; Salisbury 1985; Sperling 1976; Sun 2006; Wangyal  2007). In the spring of 1935, Chinese Communist Party armies had been pushed to the borders of China in Sichuan by stronger Kuomintang forces. Among them were the First Front Army led by Mao Zedong and the Fourth Front Army led by Zhang Guotao. Mao and Zhang were old acquaintances from the early days of communist organizing, but they were not friends. The meeting of their two armies in the Tibetan borderlands was therefore not a time for joyous reunion. Charged by army headquarters to rendezvous and jointly orchestrate a plan for their combined 80,000–90,000 troops (plus around 70,000 noncombatants in Zhang’s army), Mao and Zhang began discussions over a banquet in—of all places—a were other high-ranking party members such as Zhou Enlai and Zhu De. Mao and Zhang decided to head deeper into Tibetan country as Kuomintang armies were too strong in this part of Sichuan, but they also had a major difference of opinion. Mao wanted to get back to China as soon as possible, in the safest, most direct way. Zhang, on the other hand, wanted to continue northwest towards the Muslim territory of Xinjiang (East Turkestan) and the border of the Soviet Union where he hoped for assistance and reinforcements from Moscow (Salisbury 1985: 259). The communist troops were in dire straits. Long March veterans remember that there was little food available locally, no rice to be found, and barely even other grains or animals to be bought or raided (Sun 2006). In addition, according to survivors of the Long March, it was almost impossible to develop good relations with the local Tibetans. One army official recalled, “They didn’t speak our language and we were there and we had to eat and we took their sheep and cattle—how could we have a good relationship?” (Li Xiannian quoted in Salisbury 1985: 316). Until reaching Tibet, the communist armies prided themselves on not taking anything from the people, and for paying in cash for anything that they needed. Sangye Yeshi, known in Chinese as Tian Bao, one of the very few Tibetans who joined the Long March as a member of Zhang’s Fourth Front Army, stated that the Fourth and First Front Armies stayed for months and months in Tibet, killing cattle (a sin to Tibetans), and stealing grain (including grain that had been given to monasteries as offerings, again a sin): “The First Front Army . . . moved through empty villages. The people had run away. If the troops were to survive, they had to slaughter any cattle they found and dig up the grain that was hidden. On the other hand, the Red Army had to live. It is hard to say who was right and who was wrong” (Salisbury 1985: 255). As the situation deteriorated from unbearable to even worse, Zhang proposed to Mao that they retreat south towards KMT territory. Infuriated, Mao packed up his troops at 2 a.m., and started marching them north. Zhu De, the commander in chief of the entire communist army who was on good terms with both Mao and Zhang, headed south with Zhang. While Mao and his men triumphantly—and with relief—reached China, specifically Shaanxi, Zhang’s group headed south towards Chengdu, but were defeated by KMT troops and had to retreat deeper into Tibetan areas. They went to Sherap’s area of TreHor near Kanze. They stayed in this area until the summer of 1936 when the troops, whose numbers were now reduced to about 40,000, split again. Some went with Zhu De east across the snow-covered ranges and grasslands to China, and the rest went west with Zhang towards Xinjiang. This latter route took them through areas under the control of Hui Muslim warlords allied with the Kuomintang who defeated and destroyed Zhang’s Fourth Front Army. Zhang survived the battle and retreated to China where he met with Zhu and Mao in Shaanxi in October 1936. The Long March was over. Conventional history, then, leads to the conclusion that Mao was not a part of the army that went into the Tibetan region from where he would have escaped in Tibetan disguise. The troops who had been in Sherap’s area of Tibet were Zhang and Zhu’s troops, not Mao’s. Getag Tulku would continue to collaborate with the communists, or so it seemed. 5 Tibetan perspectives complicate a depiction of him as a model for Tibetan collaboration with the Communist Party (Wangyal  2007; Woeser 2012).6 Some Tibetans in exile I spoke with suggested that Getag Tulku was not sympathetic to communism or the Chinese, but was instead duplicitous to them, that he was secretly working in ways he thought beneficial to Tibet.7 Others, such as Sherap, suggested that the situation was more complex than a binary opposition of pro-Chinese or pro-Tibetan. It was instead about the range of sometimes competitive, sometime complementary ways to fill in both of those categories. Researching Getag Tulku’s story finally helped me to make better sense of Sherap’s history. In 1982, a formerly classified report by a Chinese eyewitness about the Chinese proclaimed liberation of Chamdo was officially published in Lhasa. Detailed in the essay was Getag Tulku’s attempt to convince Tibetan government representatives in Chamdo to cooperate with the new communist government. Getag Tulku, the author wrote, had been a communist supporter since the time of the Long March in 1936. Not only that, but Getag Tulku hid wounded communist soldiers after the rest of the troops had left, so that they wouldn’t be captured by the Kuomintang. Further, “Geda disguised the Communist wounded in Tibetan clothes and treated their wounds” (as cited in Goldstein 1989: 685). Getag Tulku disguised the Chinese soldiers in Tibetan clothes. So, what do we now know? At the very least we know this: During the Long March, Chinese troops came to this area and stayed for months, splitting on their departure; many of those who went north were killed, while those who went east, including Zhu De, mostly survived the journey. While the historical record suggests it was Zhu De rather than Mao who was sent out of Kham with Tibetan assistance, if not in Tibetan disguise, what is important here is that the story Sherap tells in exile is focused on Mao rather than Zhu or Chinese soldiers in general. Why does this matter? What insights do we gain from the exile coding of Mao as a Tibetan charity case? Mao Zedong is the strongest figure of alterity in the Tibetan exile community. Mao epitomizes multiple categories of possible difference: he was Chinese, communist, modern, Han, and he was not Buddhist (and for some children in exile, he was believed to be an actual monster). The iconic Mao is the one who claimed he liberated Tibet, bringing socialism, destroying Buddhism, and causing the Dalai Lama to escape into exile. Sherap’s story of Mao in Tibetan disguise is of a different Mao, of a younger man, one not yet powerful, not yet an enemy of Buddhism. This pretriumphant Mao does not make many appearances in Tibetan history. Instead, Mao usually appears at the time of invasion, in the period of the People’s Republic of China, and with his image and story highly structured by the Chinese state. Altering the figure of Mao is not a light matter within the PRC, but what about outside of it, outside the disciplinary forces of the state? Interpreting Tibetan truths of Mao in exile requires assessing their social being and their politico-cultural production within and across multiple states and sensibilities. In the hands of an anthropologist, the historicizing of history within space and time must also be ethnographic. History is a product of culture; temporal shifts in how the category of history is filled in are cultural responses to internal logics and contradictions, and to external lessons and conflicts. Getting at the ethnographic grounds of history is thus to get to Tibetan understandings of truth and possibility. It is to take seriously a historical rendering of Mao that Tibetans would recognize as possible (and powerful) even if they did not categorize it as factually true. As Clifford Geertz might say, this is not necessarily a story Tibetans tell themselves about themselves.8 Or is it? Anthropology, compassion, and Homo narrans Tibetica Stories are energetic; they mediate social and other forms of difference and they persist through time, possessing and revealing a preserved, concentrated strength that is simultaneously timeless and deeply temporal (Benjamin  1968). While anthropologists have long collected and crafted stories, Michael Taussig contends, “anthropology is blind to how much its practice rests on telling other people’s stories—badly. What happens is that those stories are elaborated as scientific observations gleaned not from storytellers but from ‘informants’ ” (Taussig 2006: 62). A new historical anthropology takes stories and storytelling seriously, understanding both in expansive, open ways. A storyteller is one who narrates, is any individual who has a story to tell and who chooses to tell it, whether it is a story passed down through the generations or a narration of something that happened two days ago. To receive and retell a story is different than receiving and relaying information; it is to take narrative seriously as a key to human experience (Bruner 1984). How we have done this in anthropology has changed over the years. Anthropology’s historic turn of the 1980s cut across theoretical paradigms: structural, interpretive, poststructural, feminist, and material.9 Initial concerns of understanding human action in relation to structure and event, as well as in analyzing cross-cultural encounters, are best represented by Marshall Sahlins’ “structure of the conjuncture,” or “the way cultural categories are actualized in specific context through the interested action of the historic agents and the pragmatics of their interaction” (Sahlins 1992: 80–81; 1981). Clifford Geertz helpfully shorthanded this as “the way in which the logic of a culture is revised when people go so far as to act in terms of it” (Geertz 1982). The dynamics of acting in terms of a cultural logic—that is, intentionally acting on convention—result in the emergence of new, unanticipated cultural regularities (Sahlins 1981). From this focus on structure and macro-level histories, the field next moved to process, acknowledging the politics of historical production in a more ethnographic, less scientific way than the structural approach. As John and Jean Comaroff explain in Ethnography and the historical imagination, this is historical anthropology as “dedicated to exploring the processes that make and transform particular worlds—processes that reciprocally shape subjects and contexts, that allow certain things to be said and done” (1992: 31). For some, Tibetan-ness is at its core characterized by an emanation of compassion (snying rje; byang chub kyi sems) , which was said to be a daily lifelong practice with much deeper significance than its English translation, “compassion.” It was also described as being at the core of being a nang pa [insider], much more so than more overt, public actions such as visiting monasteries or participating in large religious ceremonies. As such, certain modes of behavior and composure were thought to be outward manifestations or bodily inscriptions of this snying rje at the center of Tibetan identity (2002: 236). By contrast, in contemporary Tibet as part of the People’s Republic of China, Françoise Robin (2009) contends compassion has only recently gained power as an important public marker of Tibetan-ness after years of downplaying Buddhist virtues in relation to the Chinese Communist Party. Sherap’s narration exceeds the expected content of compassion, offering not only Buddhist prayers but also material action: charity in the form of disguise. Does ethnographic theory offer useful ways to think anew about history and narration (and vice versa)? In their Foreword to the inaugural issue of HAU: Journal of Ethnographic Theory, Giovanni da Col and David Graeber outline what a “return to ethnographic theory” might look like. Their project is a conceptual one, rooted in the longstanding anthropological practice of locating meaning and knowledge in concepts particular to any given society, especially those not easily translatable across societies. These concepts that exceed translation, that remain in the space of disjuncture are the stuff of ethnography, giving body to ideas and practices in different worlds (da Col and Graeber 2011). In using the Maori concept hau via Marcel Mauss’ writing on it, they invoke “everything that is equivocal, inadequate, and yet nonetheless endlessly productive and enlightening in the project of translating alien concepts” (2011: vii). In this view of anthropology, ethnographic insights arise out of translating the untranslatable from the inside out rather than outside in, and in so doing, push on what we collectively know about the world and how people live in it. Theory is generated in the field rather than imported from the outside: the idea is to start with the concepts that ground people’s lives, worldviews, actions, and words in ways particular to that community. Ethnographic theory à la HAU is a challenge to rethink our theoretical starting places. It is a call to start with mana or tabu or fago rather than with sovereignty or affect or conversion. Or, as da Col and Graeber put it, to begin with the Mongolian nomad rather than with the Deleuzian nomadic. This is ethnography as a “pragmatic inquiry into conceptual disjunctures” (da Col and Graeber 2011: vii). By this, I understand them to mean that ethnographic research is an effort to identify and make sense of those cultural moments and events where things that matter are reconfigured, rather than continuing as always, and that this often takes place in the encounter between different worlds or is visible in their conjuncture. They further explain this to be more a site of conceptual excess than of incomprehensibility, and propose for HAU the collective project of “ethnographic translations of those excessive remainders, remainders or wonders that arise when worlds are (happily, productively) out of joint” (ibid.). In embracing disjunctural productivity rather than working to establish a correspondence of meaning across systems, they highlight the felicitous theoretical intractability of concepts that travel in disguise. The Ifaluk concept of fago, for example, anthropologist Catherine Lutz can only translate using the three English words “love, sadness, compassion” (1988). This inadequacy of conceptual (or linguistic) commensurability does not prevent the reader of her ethnography Unnatural emotions from gaining a rich sense of fago as lived and experienced by the Ifaluk. In the story of Mao in Tibetan disguise, I am not so much translating a concept as working through a conceptual disjuncture or contradiction. Sherap’s reconfiguring of Mao is nothing if not a rearrangement of “preconceived notions and categories by juxtaposing different cultural images and positions” (da Col and Graeber 2011: vii). But why this particular reconfiguration, and with what claims on and repercussions in the world? Sherap’s narrative play in garbing Mao in a Tibetan robe was a provocation for reconsidering Mao in relation to Tibet. While there were Tibetans who did join the Chinese on the Long March, and while several decades later, communist Chinese soldiers would pose as Tibetan guerrilla soldiers, Mao is not in ethnic cross-dress of his own volition. He is disguised under the advice of a Tibetan Buddhist lama, disguised so that he literally may survive, ironically shepherded out of Tibet by Tibetans only to later send his emissaries to take over the country and to attempt to destroy Buddhism. Sherap says many people told this story of Mao and Getag Tulku when he was a child. I interviewed eleven other Tibetans from Sherap’s area of TreHor; all men, except for one woman, they lived scattered throughout India and Nepal, in Dharamsala and Darjeeling, Kalimpong, Kathmandu, and Pokhara. All were born between the years of 1925 and 1945, meaning they would have been either very young or not yet born during the time of the Long March. None of them told me the story of Mao in Tibetan disguise, but what histories did they tell? Dhargye Monastery’s close relationship with the Tibetan Government, and especially with the 13th Dalai Lama Thubten Gyatso (1876–1933), was frequently discussed. Several discussed the war between Dhargye Gonpa and Beri Gonpa; three mentioned how the Tibetan government lifted all taxes on Dhargye Gonpa for military service to the government during and following the war. One drew two maps: one map of the immediate area surrounding the monastery, hills to the north, west, and south, and a second map situating the TreHor area in relation to northern Kham and southeastern Amdo. Several gave detailed religious information about the monastery, its leaders, and monks, as well as highlighted the enrollment of TreHor Khampas in each of the great Geluk monasteries in the Lhasa area. There were thirteen Geluk monasteries in the TreHor area and four Nyingma ones; Dhargye Gonpa was Geluk, and was the largest and most important of all the monasteries. Two men told histories of Dhargye Gonpa fighting with people from the southern Kham area of Chatreng. One man told me of the vivid dreams he had, forty years after leaving, of Dhargye Gonpa and the people he had known there. Two friends I interviewed together pulled out old photographs of the monastery and gave rich, running commentary on the photos: who had lived in this room, who in that room, what was behind this wall, what had happened at this particular gate, and so on. “So many monks from Dhargye Gonpa used to live here [in Kalimpong],” they told me. “They used to tell story after story, but they are all dead now.” Finally, two individuals told me the Long March had come through their area. “It was before I was born,” said one. “At that time, the Chinese were not so powerful. Mao himself did not come to our place.” No one mentioned Getag Tulku. In some disjunctures, continuity is found. For five years running from 1994–1999, my field notes are dotted with some variation of the phrase “I went to Sherap’s shop today.” While I spent time with Sherap and his family in their home and also saw them at community events, it was in the store that the family’s version of history unfolded. Sherap’s interest in history and in passing it on to his children was matched by his wife Dolkar’s appreciation of history as inheritance. My drop-ins were almost always unannounced, and our conversations usually spontaneous, reacting to the local politics of the day, or to a story Sherap had mentally filed away to tell me, or at times prompted by my requesting him to “Tell me about ___” with any number of things filling in that blank. Sometimes neither husband nor wife was in the shop, and instead I sat with one or some of their kids, at the time all in their teens or early twenties. The kids were as versed in the politics of history as their parents, an education garnered over a lifetime of listening to their father and mother discuss history as a meaningful part of their life. From the very first day I walked into the shop and introduced myself, Sherap set the tone for narrating histories that were always political and often fantastic. Sherap’s histories were detailed. Names. Numbers. Dialogue. Movement. These were not histories that stayed still or traveled in straight lines. Instead, they moved erratically and they traversed scales at a dizzying rate at times, from the very local and personal on up to the national and global and back again. Built into his histories was an insistence on narrating from a defensive position, that is, from that of defending Tibet vis-à-vis China. “My monastery, Dhargye Gonpa,” he said many times, “always fought with the Chinese. It was like a military camp. . . . The Chinese were really scared of us. They thought the monks of Dhargye Gonpa were some kind of mystical figures. We had long hair, swords, horses. We had to look out for the whole country. We had to defend it.” His were histories that could only be told safely in exile. On a hot, humid day in July 1995, two of Sherap’s children and I were the audience for an epic four-hour tale of Tibetan history that unfolded in a combination of English and Tibetan. The central topic was about Tibetan fighting with the communist People’s Liberation Army in the 1950s and 60s but to tell this history he had to move through time and space to also discuss earlier Tibetan fighting with Chiang Kai-shek’s Kuomintang army, the seventh century Tibetan emperor Songtsan Gampo, an evil king from a nearby region, the CIA, the KGB, how he disagreed with the historical rehabilitation in exile of some Tibetans from traitor to patriot, and how his area of TreHor in Kham had been a sponsor of the great Buddhist teacher Tsongkhapa in the fourteenth century, thus linking Dhargye Gonpa and the local people with the Gelukpa school of Buddhism and therefore with the Central Tibetan government under Dalai Lama’s Gelukpa lineage since the seventeenth century.10 Sherap’s histories reminded me of those told by the anthropologist Michel-Rolph Trouillot’s father, a professional historian who relished telling histories around the dinner table.11 As Trouillot tells it, these were histories that came into the room with you, inhabited by historical figures who came to life as if they were friends or relatives. In Sherap’s case, actual friends and relatives were in the histories he told. Friends helping each other, uncles fighting Chinese soldiers, and intrigue and deception were always involved. His were stories that had both the American anthropologist and the familial Tibetan audience listening on the edge of their chairs. The Tibetans did not always win. Sherap’s historical accounting included defeats. One such history was about when Dhargye Gonpa lost to the Kuomintang. Family frames the story as Sherap told it: “My grandfather had looted gold from the KMT and also killed many Chinese soldiers. He was arrested, jailed, and sentenced to be beheaded. However, he was first to be given several days to go home to visit with his family. His wife, Sherap’s grandmother, came to the prison to meet with him. Grandfather told Grandmother what was going to happen, and sent her to Dhargye Gonpa to meet her brother, a monk renowned for his bravery and fighting skills. Her brother, Sherap’s uncle, gave her specific instructions on what to do, saying, ‘You go back and arrange three horses. One with lots of food, one with a sleeping blanket and supplies, and one with two big baskets with a blanket each inside. Don’t tell anyone. The day after tomorrow, I will kill the Chinese and bring your husband back safely.’ Grandmother went and arranged everything as instructed. Uncle meanwhile confided in friends about his plan, asking them to fight for him if he died. There was a giant prayer wheel shelter in the middle of the road. He hid there. He had on his protective amulet (mtshon srung) and carried only a sword. Then early in the morning, one Chinese officer and thirty soldiers came with my grandfather tied on a horse. Uncle came out of the shelter and saw the Chinese had rifles and pistols but not very good ones. There were lots of people around, and he was a monk, so there wasn’t any suspicion. Then with his sword, he beheaded the Chinese officer and cut others in half, then took one of their pistols and killed the others. Uncle got two pistols and shot them both in the sky, yelling, ‘Use bullets, I won’t die. I’m bullet-proof, so you better run away!’ The Chinese ran away. Uncle’s five monk friends went to the hot springs and got my grandfather and the horses. The Chinese went back to Kanze to get more soldiers. Uncle, Grandfather, and their friends went up the pass as if they were going to Nyarong. At night they came back and Uncle crossed the river with his two sons and went north. The next day the Chinese went south looking for them. Uncle and his sons made it safely to Qinghai and stayed there for three or four years before eventually heading to Lhasa.” And then Sherap concluded that particular story and segued back to talk more about Dhargye Gonpa. History continued. What if they didn’t? What Sherap was asking for was a reorientation to Tibetan history. He and his fellow veterans encouraged me to consider what Tibetan history would look like as told from the periphery, that is, from Kham rather than Lhasa. Or, with Mao in Tibetan disguise rather than in an army uniform. The former shifts perspective geopolitically, the latter shifts perspective in terms of the political claims made. Sherap’s history of Mao in Tibetan disguise is not a counterfactual history. This is not a what if sort of history. Sherap narrates Mao into Zhu De’s story of meeting Getag Tulku, generating an excess of meaning. That is, his narration exceeds historical truth and brings us back to Taussig’s concern with the social being of truth. Truth is not limited to precision. Truth has excesses and these are made manifest in different registers: emotional, epistemological, and moral among others. Sherap’s historical narrations bear this out. This space of excess is productive: his uncle’s smarts and strength defeat the Chinese and save his grandfather; Getag Tulku robes Mao in Tibetan dress and, at least temporarily, facilitates the Chinese leaving Tibet. These are histories that exceed expected limits of the encounter. One monk beheads a Chinese official and slays many others. A reincarnate lama saves Mao’s life by disguising him as a Khampa. These are histories that push the conventions of social and moral behavior beyond what is normal or sufficient. In troubling the standard narrative of Tibetan defeat by the communist Chinese, Sherap is pushing on the structure of this particular conjuncture, the Tibetan-Chinese encounter. This is not a reproduction of convention in a “structure of the conjuncture” model. But, what is it? Not all narrations play by the rules of hegemony; some ignore, at least in part, theoretical language that claims cultures to be simultaneously enabling and constraining. Tibetans such as Sherap tell histories in exile of events and experiences that took place in Tibet decades earlier. At times, they speak from within registers other than the prescribed or expected; they make other claims to past, present, and future, and rest on other ways to fix truths. Sherap’s unorthodox history of Mao in Tibetan disguise is one such narration that brazenly sidesteps fact while simultaneously inhabiting a historical discourse of truth. I did not hear this story from him just once, but several times and asked him directly about its veracity. This happened, he repeatedly claimed. In turn, my main ethnographic dilemma in this essay is to ask why he asserts this unorthodox historical claim and with what effects. What does it mean for a Tibetan outside of Tibet to cloak Mao in Tibetan dress? What position does it stake in the world? Sherap narrates this history as a Khampa Tibetan veteran devoted to the Dalai Lama, as someone who fought against the communist Chinese and yet who incorporates compassion for the enemy into his spiritual practice. As with other veterans, the histories he tells exceed standard historiography in the exile community (McGranahan 2005, 2010a), challenging the history of the Tibetan-Chinese encounter as primarily a diplomatic one, and provocatively suggesting we rethink Tibetan encounters with Mao. These are counterhegemonic histories in a classic sense (say, in the spirit of Subaltern Studies) of taking advantage of the openings in any hegemonic system, but also go beyond that. These are historical offerings in a Buddhist sense, with material and symbolic aspects, designed to attain merit, but grounded in the social and the political as much as the religious (and rooted also in the imperfections and contradictory intentions of the person making the offering). They are histories narrated in a register not aligned with the conventional historical polemics that exist between Dharamsala and Beijing, but that generate their own polemics and possibilities. The Tibetan exile government official who gave me names of people to speak with for my research was aware of this. After he gave me the list, he asked me to come back after my interviews so that he could correct what they had told me. Sherap’s understanding of what it means to make something known or clear— renegade though his history of Mao in Tibetan disguise is—rests on senses of cultural, political, and narrative propriety that are produced and reproduced through disciplinary practices and discourses linked to the Dalai Lama, the exile government, and the status quo in exile. Yet, semiotics of Mao are not singular, nor are they limited to exile. Semantically and pragmatically, the figure of Mao possesses interpretive continuities and discontinuities for Tibetans inside and outside of Tibet. Despite the different historic and geographic distributions of Tibetan experiences of Mao, and the varying conditions of possibility, some shared spheres of interpretation do exist. The most prominent is religion. While religion is by no means the only interpretive framework Tibetans use to come to terms with Mao— secular historical positivism is another, for example—it is one that provides options beyond guidelines for moral behavior or strategies for the accrual of merit. For Tibetans, religion also provides conceptual and material means for activating the cover of the norm, of expected activities and beliefs, while simultaneously enabling their transcendence. Mao Zedong once stated that the communist army’s “only foreign debt” was that incurred to the Tibetans while on the Long March (Sun 2006: 178). By all available accounts, the Chinese soldiers were downtrodden and starving, and many died while in Tibet. Yet, as Sherap insisted, the Tibetans saved Mao and Zhu. They would have died otherwise. The karmic merit accumulated in this compassionate act is perhaps some sort of historical balm for the return of Mao’s soldiers to Tibet thirteen years later. Mao himself never returned to Tibet. Yet, if he did not return in person, it remains impossible to travel through Tibet without visible reminders of his presence in public and private settings. Often it is the iconic portrait of Mao that hangs in Tiananmen Square (and that was famously redone by Andy Warhol in the 1970s and by Zhang Hongtu in the 1990s—see fig.2.). Contemporary displays of Mao’s image in Tibet are not necessarily nostalgic or capitalist as is often the case in other parts of China.12 Instead, they might be remainders from the past displayed in the present to ward off state suspicions of political loyalty.13 Or they might be present in response to the current “Nine Must Haves” political campaign launched in December 2011. This campaign mandates that the images of four Chinese political leaders—Mao Zedong, Deng Xiaoping, Jiang Zemin, and Hu Jintao—be displayed in Tibetan homes, businesses, schools, and monasteries. In order to become good citizens of China, Tibetans still need Mao. As prevalent as Mao’s image has long been in Tibet, so have his words. In earlier decades, Mao’s sayings blared from public address loudspeakers. Cadres and students and prisoners all memorized Mao’s Little Red Book.14 Mao’s sayings functioned as proverbs, as shorthand for communicating political and moral messages. They were broadcast, they were read, they were spoken, and they were inscribed on signs and even on the landscape. Four or five decades after the Great Leap Forward and Cultural Revolution, one can still find the sayings of Mao laid out in rocks painted white on Tibetan hillsides. During a period of relative political quiet in Tibet, I once asked a Tibetan friend why these sayings had not been dismantled. “People are scared,” he said. “Better to just leave it as is and not risk trouble.” Tibetan performances of political loyalty vis-à-vis Mao Zedong have long been very tightly directed by the state: images of Mao held high and paraded during public events, the wearing of badges bearing his profile, the words of Mao on school walls and in children’s memories, and on to the legislated wearing by Tibetans of specific Chinese clothing (e.g., Mao suits, Mao caps, etc.). Such patriotic reeducation campaigns are pedagogical and punitive, offering little room for responses other than the expected performances of gratitude and obedience to Mao and the Chinese Communist Party. How do Tibetans explain and react to the appearance of Mao Zedong in their country and on their altars? Buddhism is one possible interpretive framework. Some Tibetans place the atheist Mao into a Buddhist framework to resituate their relationship to him, and consider Mao as part of a lineage of emperors of China (both Han Chinese and Manchu) understood to be emanations of the Buddhist deity Manjushri (in Tibetan, Jampelyang/’jam dpal byangs).15 As a bodhisattva, or enlightened being, the wildly foreign Mao is brought into knowable form through which the difficult work of coming to terms with his drastic transformation of Tibet can be attempted. What might this look like? In the region of Dechen, Giovanni da Col reports that Mao is commonly spoken of as being an embodiment of Jampelyang. He is also considered an example of dbang thang, a force associated with destiny and understood as a “power that may be employed to influence the course of events and avoid dangers” (da Col 2007: 221). As he explains, “The success of Mao’s revolution against all odds, the occupation of Tibet and Mao’s fame as a womanizer are undeniable signs of his wangthang [dbang thang] to the point that some households worship him as a protector god (srung ma), men secretly ask his help in case of sexual dysfunction and couples hang his portrait above their bed” (Da Col 2007: 221–22). In her research with retired State Farm workers in Tibet, Emily Yeh (2008) found they remembered Mao’s concerns with equality and anticorruption, and entwined their nostalgia of the collective era with a complex and contradictory identification of Mao as Jampelyang. As one couple explained, “Chairman Mao—now he was really an emanation of Jambeyang,16 just like they said. Really he was! Back then things were much better. There was no ‘back door’ and corruption, like there is now. Back then, if a leader was corrupt, Mao just had to sign his name and that guy would be executed! Things were better back then” (Yeh 2008: 69). The most potent example of the intertwining of Mao and Buddhism comes via Tibetan spirit mediums. As incongruous as Mao and spirit possession might seem, it was a phenomenon also documented among other ethnic groups in China (Chao 1999; Mueggler 1999). The most well known instance of Tibetan deities speaking about Mao through a medium was during the Cultural Revolution in the case of the young Buddhist nun Trinley Chödrön (Shakya 1999; Goldstein, Jiao, and Lhundrup 2009). As elsewhere in China, the Cultural Revolution in Tibet was devastating. Communist Party Red Guards destroyed the four olds: old thoughts, culture, customs, and habits, including religion. Over the course of the Cultural Revolution, there were changing and competing interpretations of Mao Zedong thought. In the Lhasa area, two large factions of Red Guards formed, Gyenlo and Nyamdre, with opposing ideas about how to interpret and implement Mao Zedong thought (Goldstein, Jiao, and Lhundrup 2009). One participant in these debates and the ensuing physical violence was the Buddhist nun Trinley Chödrön. During this politically fraught time she felt called to become a spirit medium, so she secretly had the appropriate rituals done to activate this capacity. In trance she began speaking about Chairman Mao, then also began praising him in public and became a member of the Gyenlo faction. She is remembered by villagers as saying, “I am the right shoulder [hand] of Chairman Mao” and “Chairman Mao will not treat us badly, since he is an incarnation of [the Buddha] Manjushri” (ibid. : 81). She claimed to be possessed by Ani Gongmey Gyemo, aunt of and advisor to Gesar, the Tibetan deity-king who was a violent defender of Buddhism. [The 14th Dalai Lama] Tenzin Gyatso’s country was given to Chairman Mao by the evil lama.17 Chairman Mao then passed it on to the world of the gods. In the past, because we didn’t have the right to speak, it was like having fire in the stomach but not daring to spew out smoke from the mouth. . . . The whole country is not the country of Chairman Mao or Tenzin Gyatso. It is the country of the gods. . . . In the human world, Chairman Mao is the judge of wealth and material things, and I, the nun, am the judge of whether people are good or bad (ibid. : 103). Eventually Trinley Chödrön’s faction lost the political struggle. She was captured and executed. What remains is the profundity of her story. Mao as a Buddha. Tibetan deities asserting their connection to Mao through spirit possession. Assigning the material world to Mao, the spiritual world to the deities. Each of these apparent contradictions embodies four olds to be destroyed during the Cultural Revolution. A young Tibetan nun instead asserted these religious claims at the height of Cultural Revolution political frenzy while possessed by a deity associated with the militant defense of Buddhism, and did so while simultaneously proclaiming and performing loyalty to Mao. Trinley Chödrön’s “imaginative formulation of novel worldviews” (da Col and Graeber 2011:vii–viii) appears indebted to both Tibetan Buddhism and Mao Zedong thought.18 At a time when Buddhism is under severe attack, she puts the spiritual and the religious and the secular political together. She goes well beyond what was permitted by the state at the time, and yet her exceeding of Tibetan norms for behavior in such periods was striking and unusual and solidly within the realm of the possible in Tibetan terms. Thus, the novel worldview of her ethnographic and historic imagination is the encounters between them. People do not always need to act or speak in such registers of excess. However, at times when they do need them, such spaces and strategies are both available and culturally recognizable. never even conjured by Glang da ma. Mao as Lang Darma. Or to be even more precise: Mao as exceeding Lang Darma. If Mao has been an unsurpassed destroyer of Buddhism in Tibet,19 the Tibetan response to him in exile does not always dwell in this truth but instead works to conjure other truths. Right around the same time in the mid-1990s that Sherap first told me his story of Mao in Tibetan disguise, the Australia-based Tibetan artist Karma Phuntsok painted two unusual paintings. The first he titled “Chairman Mao in Tibet” (fig. 3). 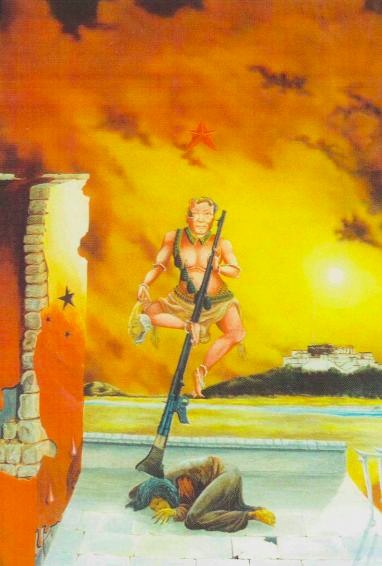 In this graphic image, Mao is depicted in the pose of the Buddhist deity Manjushri/Jampelyang, hovering over the beaten body of a Tibetan woman, with a sash of grenades around his neck, and the Dalai Lama’s Potala palace and monastery in the background. The predominant colors in the painting are red and yellow, the colors of the Chinese Communist Party reinterpreted as the colors of war and destruction. Fixed into Tibetan Buddhist position by a Tibetan artist, this painting and the second one, recall a sentence from the Long March story—“At that time, Mao believed in religion. … He was a Buddhist.” On the surface, as an image of Mao with the Sakyamuni Buddha (the historical Buddha) on his forehead, Karma Phuntsok’s second painting appears relatively sedate (fig. 4). Chairman Mao in Tibet. Courtesy of Karma Phuntsok. Chairman Mao with Shakyamuni Buddha. Courtesy of Karma Phuntsok. But, sedate or subtle it is not. 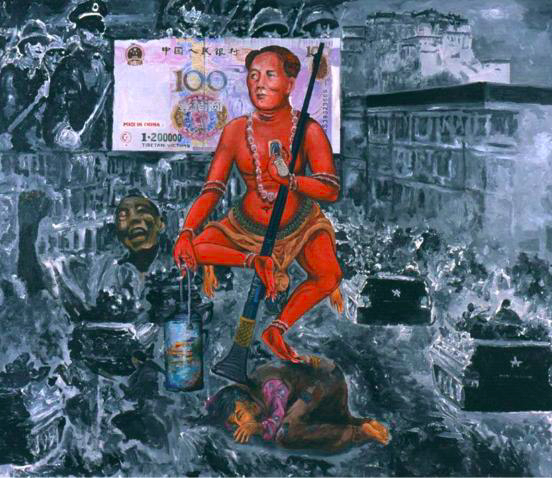 When I first viewed this painting at Karma Phuntsok’s 1999 Continuum exhibition at Amnye Machen Institute in Dharamsala, some Tibetan friends told me they considered it to be more grotesque and disturbing than the “Chairman Mao in Tibet” painting. After all, wrathful deities presiding over fearful scenes are a familiar and regular part of artistic depictions of the Buddhist pantheon of deities. 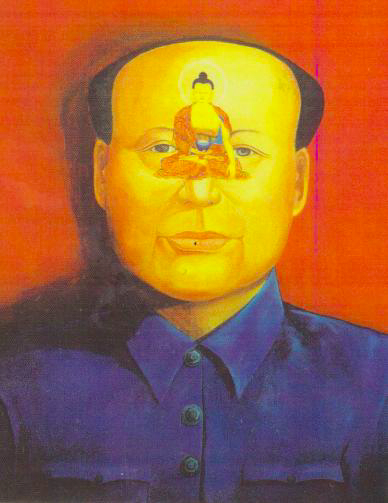 But Mao with the Buddha superimposed on his face is neither familiar nor regular. Painted two years after “Chairman Mao in Tibet,” the second painting continues the story of Mao in Tibetan disguise, situating Mao in deferential relationship to Buddhism. Mao’s potential Buddha-Mind is invoked here, as emperor and bodhisattva, or perhaps just as beneficiary of Tibetan Buddhist benevolence. Again: prayers and compassion offered to he who has most transgressed Tibetan senses of self, world, and order. 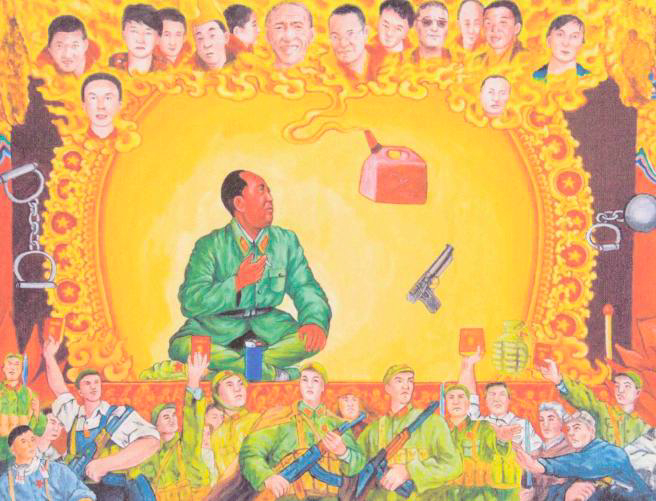 Over a decade later, in 2010, Karma Phuntsok painted a third image of Mao in Tibet, “The Thermos Bearer” (fig. 5). The Thermos Bearer. Courtesy of Karma Phuntsok. The Self-Immolators. Courtesy of Karma Phuntsok. Karma Phuntsok’s redone image is based directly on the first but with striking changes: Portraits of the self-immolators at the top, in flames; images of Chinese soldiers and peasants at the bottom, painted in a socialist realist style, expressing their revolutionary zeal, and with many of them holding Mao’s Little Red Book high in the air as if it were a weapon. Scattered around the image: a petrol can. A lighter. A match. A grenade. A gun. Handcuffs and leg shackles. As striking as all this is, there are two other components that are even more politically poignant. Most notable at first glance is the absence of Getag Tulku. The Tibetan lama is removed from the image entirely. A second or third look, however, and one focuses on presence rather than absence: Karma Phuntsok has replaced Zhu De with Mao Zedong. 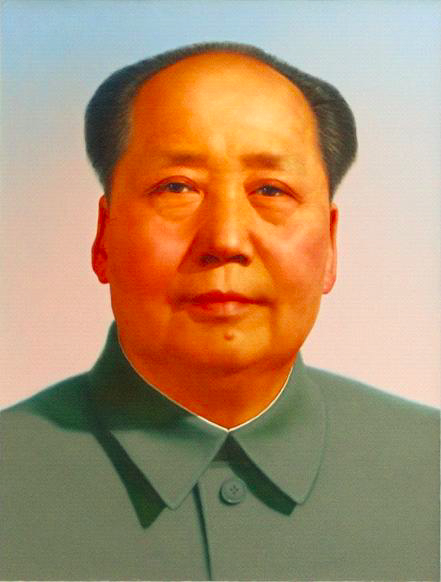 I emailed Karma Phuntsok to confirm this: had he intentionally painted Mao instead of Zhu? 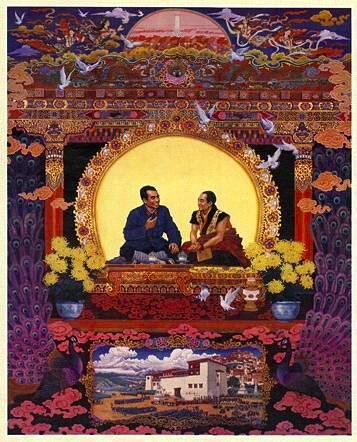 “Yes,” he wrote back, explaining that he repainted this painting to shift the perspective from that of the victors to the victims: “The figures at the bottom of the painting represent the continuing use of 1960s propaganda and control measures against the Tibetans. The Mao at center stage represents the Chinese wish for the Tibetans to deify him. The weapons and red book are his implement[s]. It might have esoteric meanings also. Mao teaching us about anger, hatred, enmity, etc.”22 In other words, the painting illustrates Mao teaching us how to generate compassion in the face of anger and hatred and enmity. What does ethnographic theory offer to this project? As da Col and Graeber admit, there is not “anything particularly new here,” just a lineage of wide-ranging “anthropological scholarship that over the last three decades has addressed . . . disjunctures, and the moments or events of ‘speculative wonder’ or ‘positive equivocation’ to which they give rise” and to which da Col and Graeber have given a name (2011: vii); hence their call to return to ethnographic theory. And yet, the particular moment we are in is new. What about the current political moment calls for ethnographic insights? Financial crisis. Political unrest. Social dissent. Around the globe, people are making new demands on the state, on private institutions, on global governing bodies, on corporations, and perhaps most importantly, on each other. Keywords for this postneoliberal world are both earnest and ironic: accountability and responsibility, revelation and representation, creation and possibility. Think Wikileaks, the Occupy Movement, Tahrir Square, Anna and Tunisia and Tibet. Possibility now feels historic, as if we are on a threshold of change. Accessing ethnographic and historic imagination is key to understanding this present moment, to engaging its conditions of emergence and its claims and excesses and refigurings and compassions as it is lived.25 Such lived experience is the starting point for ethnographic theory. Political possibility is composed of specificities and genealogies and contradictions. Real people think and feel and imagine and create possibilities as they struggle to understand the world around them. They do this in antique stores and in monasteries and they do this on Facebook and on village paths; they do so in real conversations with other people, each mediated in their own way. This is why Sherap’s story and others that stand outside or parallel to dominant historical narratives speak to both change and continuity. They are efforts to articulate new possibilities and they sometimes place the familiar into jarring, unanticipated positions in so doing. In its most interdisciplinary and expansive sense, ethnographic theory points to such possibility, to the philosophical challenge of grappling with the unexpected and the incommensurate made real and lived and acted upon. Theory and method are not separate here; new knowledge is generated in the field, in the space of human interaction, at a range of scales that traverse human being. Imagining different histories—imagining, for instance, a Tibetan reincarnate lama saving Mao by disguising him in Tibetan clothes—is at the heart of ethnographic truths and the deceptively firm grounds on which they supposedly rest. Sherap tells Mao’s history freed from the constraints of modern, linear history, but unselfconsciously claims its truths: it is unrealized possibility and also what happened. It is a story whose power and potential is still unfolding. My thanks to Sherap and his family for sharing histories and hospitality with me over the years, as well as the many other Khampa Tibetans who took the time to teach me about history and politics. For invaluable critiques on this article in draft form, I am grateful to Joe Bryan, John Collins, Elizabeth Dunn, Dawa Lokyitsang, Pete Simonson, and Emily Yeh as well as two anonymous reviewers, one of whom revealed herself to me as Charlene Makley, and Stéphane Gros and Giovanni da Col at HAU: Journal of Ethnographic Theory. A special thank you to Karma Phuntsok for permission to reproduce his artwork in this article. The National Science Foundation, the Social Science Research Council, the American Institute for Indian Studies, and the University of Michigan generously funded my research.